The flag of the Marshall Islands, an island nation in the Pacific, was adopted upon the start of self-government, May 1, 1979. The flag was designed by Emlain Kabua who served as the first First Lady of the republic,rules and specifications regarding the flag are set forth in the Official Flag of the Marshall Islands Act 1979 (Public Law 1979-1). The islands, long a part of the U.S. Trust Territory of the Pacific Islands, gained their independence in 1979, and hoisted this striking flag. The orange and white stripes are symbolic of the two side-by-side island chains within the Marshalls, the Rotok and Ralik. The blue field represents the surrounding Pacific Ocean, and the white star has a point for each district – 24 in all. 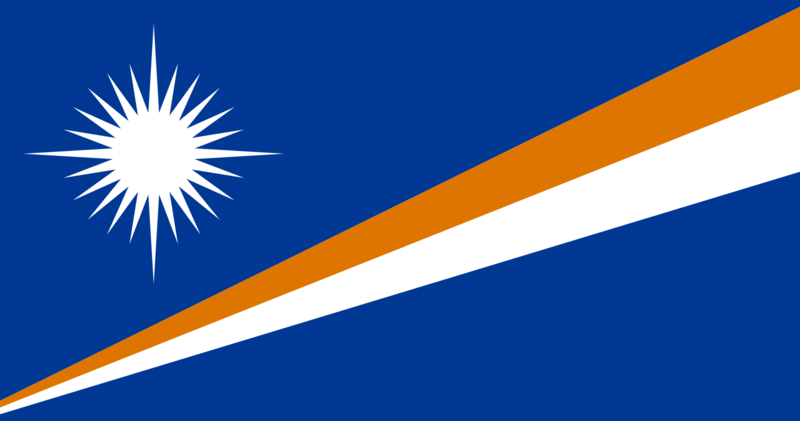 The national flag of Marshall Islands is a blue field with two diagonal stripes of orange and white radiating from the lower hoist-side corner to the upper fly-side corner and the large white star with four large rays and twenty small rays on the upper hoist-side corner above the stripes.